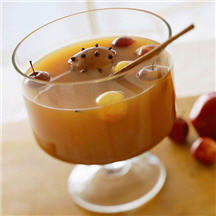 A crockery slow cooker will keep this spicy fruit and cider drink hot. In a 6-quart Dutch oven or kettle, stir together cider, lemon juice, and sugar. Add cinnamon sticks. Insert a whole clove in the peel side of each orange wedge. Add to cider mixture. Bring to boiling; reduce heat. Cover and simmer for 30 minutes. Remove orange wedges and cinnamon sticks with slotted spoon, if you like. Makes 16 to 18 (8-ounce) servings. Nutritional Information Per Serving (1/16 of recipe): calories: 136, total fat: 0g, saturated fat: 0g, monounsaturated fat: 0g, polyunsaturated fat: 0g, cholesterol: 0mg, sodium: 7.6mg, carbohydrate: 34g, total sugar: 31g, fiber: 0g, protein: 0g, vitamin C: 15%, calcium: 2%, iron: 5%.